The life of Andy Kaufman sure is strange. 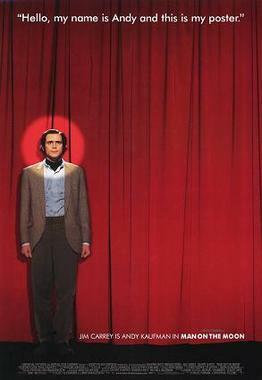 Jim Carrey gives the performance of his career as the insanely inventive comedian Andy Kaufman. Best known as lovable mechanic Latka Gravas on the 1970s sitcom “Taxi,” Kaufman shocked audiences with his caustic, off-the-wall routines that often crossed the line from comedy to performance art. Director Milos Foreman does a great thing with the film and that is that he doesn’t make the mistake of turning the story into comedic conventional pattern. With Kaufman, you never knew what was real and you never knew what was really a fraud, and the film really does show this. The great thing about this movie is that we always keep on questioning. Most of the praise really does come from the performance from the great Jim Carrey. In this film he is not Jim Carrey he is Andy Kaufman. Carrey does not use his usual funny faces and crazy freak-outs as in his other ones, instead he totally embroils the life, soul, and the mind of Andy Kaufman. Jim Carrey does a better Andy Kaufman than Andy Kaufman and its surely a sight to see. You look at Carrey in this movie and you don’t see Carrey you see Kaufman. The problem with this film though is that we don’t get a sense of what Kaufman really wanted in his life. Yes we hear and see a lot of his jokes play out but fully we don’t understand what he was gunning for. This film also seems like too much of a lover’s pool for Andy Kaufman as almost everything he did was great and he was viewed as the nicest guy ever. I heard many thought he was horrible behind the scenes and this film doesn’t show that it shows a point of view from the people who truly loved the most. DeVito and Love I think were totally miscast and didn’t really have to be in this film. I wish that the film focused a little bit more on the romance between him and Love and they don’t. The one thing I liked is how all the stars Kaufman met in his life all reprised their roles and I thought this was especially a sight to see. Consensus: Jim Carrey is amazing in this film and fully pulls it all together, but this film only shows the ups in Kaufman’s life and we never fully understand his intentions.